If a global oil shock reduces supply 10%, the price of crude will rise to $20,000/barrel, with fuel expenditures consuming more than the entire GDP of importing nations. At least that’s what you’d predict if you think the price elasticity of oil demand is about -0.02. I saw that number in a Breakthrough post, citing Kevin Drum, citing Early Warning, citing IMF. It’s puzzling that Breakthrough is plugging small price elasticities here, when their other arguments about the rebound effect require elasticities to have large magnitudes. There’s no doubt that short run elasticities are small, though the IMF figures are over-the-top small (-0.007 in non-OECD countries). What caught my attention, though, was the assertion that long run elasticities are also small – smaller than -0.1 in IMF’s table 3.1, for example. I’ve never run across an energy model with such minimalist long run elasticities. Nor have I seen statistical estimates that low. So, I dug a little deeper. It turns out that meta-analyses do catalog statistical estimates of long-run elasticity of gasoline and transport fuel demand as small as zero. (I can’t fathom how anyone could report such a figure with a straight face, given the thought experiment at top.) However, near-zero results are far from the means of such surveys. Adam Ozimek at Modeled Behavior examines some of the reasons to be cautious of small elasticities rather well. To that list, I’d add my guess, that small elasticity estimates are biased by omission of feedback and attendant consideration of measurement error in many studies. Estimates I’ve seen that have a fairly strong treatment of dynamics by econometric standards are weak by dynamic modeling standards. This may explain why no one builds energy models with a long run elasticity of -0.1: such values just aren’t plausible in a full-feedback context. A related problem is that the “long term” in estimates is often rather short. The IMF estimate, for example, uses data from 1990-2009. That’s only a little longer than one lifetime of a vehicle, and the “interesting” part, with real variation in oil prices, is much shorter than that – not long enough to turn over even half the vehicle fleet. By contrast, the time constants for urban development patterns and lifetimes of transportation infrastructure are much longer – on the order of 50 years. Indeed, when the IMF uses a longer sample (table 3.3), the estimated long-run price elasticity for the OECD is six times larger. Yet another issue is that elasticities are typically estimated via an equation like quantity = price^epsilon, where epsilon is the elasticity. The price is normally interpreted as the price of energy, but the cost a consumer faces is typically (price + indirect costs), where the indirect costs are associated with energy use but not observed. So, one ought to estimate quantity = (price+cost)^sigma (if one could observe cost). In this case, the local elasticity is diluted by the cost, but as price (or taxes) rise, the observed elasticity approaches sigma, which is greater than epsilon. … in rough terms, if energy efficiency drives down the price of energy services by 30% or 50%, then energy prices would have to increase through carbon taxes or fees by an equivalent 30% or 50%. That statement implies an elasticity of -1.0, ten to fifty times bigger than the IMF findings. To care about rebound dilution of efficiency gains at all you’d have to think that elasticities were at least -.2 or -.3, so that rebound offset 20 to 30% of efficiency-induced emissions reductions. To believe in Jevon’s paradox, where efficiency improvements increase energy use (>100% rebound), you must believe that elasticities are -1.0 or larger in magnitude. Q: Should we expect rebounds to be the same in rich and poor nations? A: No, rebound effects are almost certainly larger in poorer, developing nations. This is exactly the opposite of the IMF report’s finding, that elasticities are much smaller in the non-OECD world, implying trivial rebound effects in developing countries. So, Breakthrough, which is it? 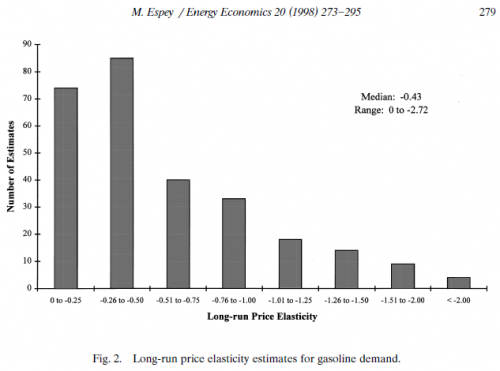 Do gasoline taxes have minimal effects on behavior because price elasticity is small? Or are efficiency measures offset by rebound effects, because price elasticity is large? They can’t both be true. Who was it that said, “the primary characteristic of a truly enlightened mind is its ability to entertain two seemingly contradictory ideas at the same time?” That’s fine for philosophy, but for policy, I prefer Jay Forrester: “if you have a model, you’ll be the only person in the room who can stand up and talk for 20 minutes without contradicting himself.” Breakthrough clearly needs a model. On February 17th, Breakthrough Institute released a new, comprehensive survey of the literature and evidence concerning the rebound effects triggered by many energy efficiency improvements. “Energy Emergence: Rebound and Backfire as Emergent Phenomena” explains why energy efficiency measures that truly ‘pay for themselves’ will lower the cost of energy services — heating, transportation, industrial processes, etc. — driving a rebound in energy demand that can erode a significant portion of the expected energy savings and climate benefits of these measures. This new set of Frequently Asked Questions explains rebound effects, how they operate, what kinds of energy efficiency improvements trigger bigger or smaller rebounds, and why coming to terms with the full scale of rebound challenges the heart of many contemporary climate mitigation strategies. You can download the full “Energy Emergence” report here, or download and view a Power Point briefing on the report here. Re-arranging the factors of production or goods and services consumed to substitute now-cheaper energy services for other goods or services (maintaining the same level of output or income). For example, a more efficient heat plant may enable a chemicals plant or metals smelter to raise temperatures in industrial processes to extract high quality product from poorer quality inputs (substituting energy for materials) or to reduce process times (substituting energy for labor). (In economic terms, this involves ‘substitution elasticities,’ or the ability of firms or consumers to take advantage of lower prices to productively re-arrange the production inputs or consumer goods they utilize). Both of these dynamics are “rebound effects,” a term for any economic mechanism that leads to a rebound, or increase, in demand for energy following an improvement in energy efficiency that lowers the effective cost of that energy service.There are other rebound effects as well (for a quick description of each, see the summary here). Our report, “Energy Emergence” surveys more than half a dozen distinct rebound mechanisms, some of which are fairly direct (like the two above), others that are more indirect (like the impact of money saved through efficiency measures as it is re-spent in the economy on other goods or services that in turn require energy to produce). Still more effects are only visible in the aggregate, at the macro-economic scale, as economies respond in a variety of ways to widespread improvements in energy efficiency. Q: So do rebound effects wipe out all of the energy savings from efficiency improvements? Think of it this way: rebound effects mean that for every two steps forward we take in energy savings through efficiency, rebound effects take us one (and sometimes more) steps backwards. We may still move forward, but not as much as we initially expected. Q: So what’s the big deal? We still make progress right? Why do rebound effects matter? So we’re counting on energy efficiency to do quite a bit of “climate mitigation work,” so to speak. The problem is that all of these estimates are based on an assumption: that energy efficiency reduces energy demand in a linear, direct, and one-for-one manner. An X% gain in efficiency leads to an equivalent X% reduction in total energy use. But the economy is anything but direct, linear, and simple, especially when responding to changes in the relative price of goods and services. When a good or service or input to production gets cheaper, consumers and firms use more of it, find new cost-effective uses for it, re-invest any savings in other productive activities, and the economy overall gets more productive overall, driving economic growth and activity. That’s the rebound effect, and it means that we can’t assume that improving energy efficiency by 20%, for example, will reduce energy demand by 20%. If we don’t accurately and rigorously account for rebound effects, we risk over-relying on energy efficiency to deliver lasting reductions in energy use and greenhouse gas emissions, and we will fall dangerously short of climate mitigation goals. Q: But I’ve always heard that rebound effects are really small. Amory Lovins has written that “we are observing only very small rebound effects (if any at all) in the United States,” for example. He says that we don’t drive our cars twice as much just because they are twice as efficient, for example. How big a deal is this? Q: So how large would rebound be if we improve end-use consumer energy services like personal transportation or home heating or appliances? A: In rich, developed nations, if we improve the efficiency of end-use consumer energy services, like cars, home heating and cooling, or appliances, the literature indicates that direct rebound effects alone are typically on the scale of 10-30% of the initial energy savings. Additional indirect and macroeconomic effects may mean total rebound erodes roughly one quarter to one third of expected energy savings in these situations.Rebound here is smallest in cases when demand for the energy service in question is already saturated (that is, we use as much of it as we would care to use), and highest in cases where the cost of the energy service is a key constraint on fulfilling demand for that service. For example, if a wealthy homeowner already reliably heats all the rooms in his or her house to 70 degrees, he/she wouldn’t increase the thermostat to 77 degrees just because our heating system got 10% more efficient. But if a poorer household can’t afford to turn the thermostat up, or only heats one room of the house with a small space heater, because the house is too drafty, then if the house gets weatherized and more efficient, that household is likely to use more energy to heat their home. In general, end-use consumer efficiency improvements in rich, developed economies will still lead to a net savings in energy, although rebound effects shouldn’t be ignored even here.